Storing file data in cloud storage can reduce IT cost and complexity, enable multi-site file sharing and collaboration, and improve recovery points and recovery times. This modern approach also changes the risk profile for unstructured data management. Done right, it can actually improve data security. Done wrong, it can create vulnerabilities that put your business at risk. The Nasuni UniFS global file system is designed to leverage cloud object storage as an infinitely scalable, geo-redundant repository for unstructured data. To secure all file data stored in UniFS , Nasuni has developed a robust security model that combines strong encryption and local authentication with the native capabilities of top-tier cloud storage providers. 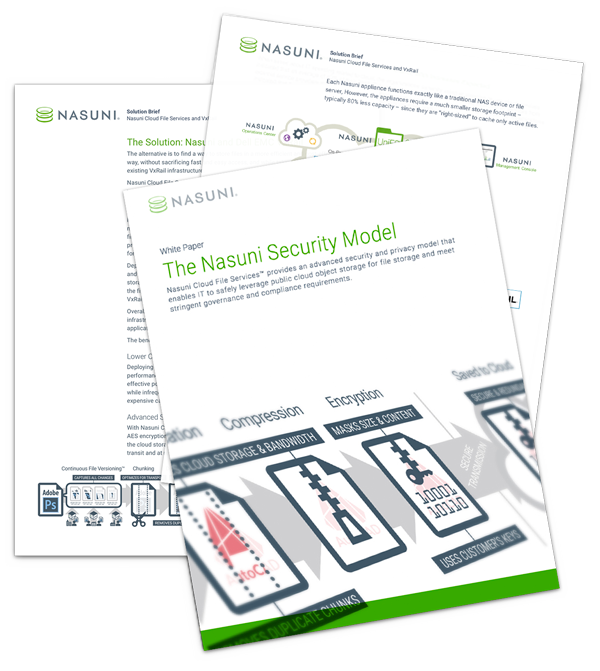 This white paper examines Nasuni's security model in detail. Download now to learn how Nasuni enables enterprises to store, share, protect, and manage file data across multiple global locations through a single unstructured data management solution at unprecedented scale, without compromising on security.